The transformations that take place in late-type galaxies in theenvironment of rich clusters of galaxies at z=0 are reviewed. 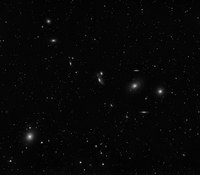 From thehandful of late-type galaxies that inhabit local clusters, whether theywere formed in situ and survived as such, avoiding transformation oreven destruction, or if they are newcomers that have recently fallen infrom outside, we can learn an important lesson on the latest stages ofgalaxy evolution. We start by reviewing the observational scenario,covering the broadest possible stretch of the electromagnetic spectrum,from the gas tracers (radio and optical) to the star formation tracers(UV and optical), the old star tracers (near-IR), and the dust (far-IR).Strong emphasis is given to the three nearby, well-studied clustersVirgo, A1367, and Coma, which are representative of differentevolutionary stages, from unrelaxed and spiral-rich (Virgo) to relaxedand spiral-poor (Coma). We continue by providing a review of models ofgalaxy interactions that are relevant to clusters of galaxies.Prototypes of various mechanisms and processes are discussed, and theirtypical timescales are given in an appendix. Observations indicate thepresence of healthy late-type galaxies falling into nearby clustersindividually or as part of massive groups. 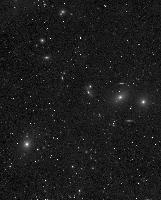 More rare are infallinggalaxies belonging to compact groups, where significant preprocessingmight take place. Once they have entered the cluster, they lose theirgas and quench their star formation activity, becoming anemic.Observations and theory agree in indicating that the interaction withthe intergalactic medium is responsible for the gas depletion. However,this process cannot be the origin of the cluster lenticular galaxypopulation. 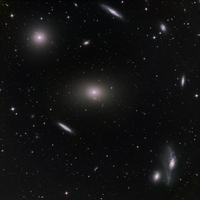 Physical and statistical properties of S0 galaxies in nearbyclusters and at higher redshift indicate that they originate from spiralgalaxies that have been transformed by gravitational interactions. A catalogue of ionized gas velocity fields for a sample of 30 spiral andirregular galaxies of the Virgo cluster has been obtained by using 3Doptical data. The aim of this survey is to study the influence ofhigh-density environments on the gaseous kinematics of local clustergalaxies. Observations of the Hα line by means of Fabry-Perotinterferometry have been performed at the Canada-France-HawaiiTelescope, European Southern Observatory 3.6-m telescope, Observatoirede Haute-Provence 1.93-m telescope and Observatoire du montMégantic telescope at angular and spectral samplings from 0.4 to1.6arcsec and 7 to 16kms-1. A recently developed, automaticand adaptive spatial binning technique is used to reach a nearlyconstant signal-to-noise ratio (S/N) over the whole field of view,allowing us to keep a high spatial resolution in high-S/N regions andextend the detection of signal in low-S/N regions. This paper is part ofa series and presents the integrated emission-line and velocity maps ofthe galaxies. Both Hα morphologies and kinematics exhibit signs ofperturbations in the form of, for example, external filaments, inner andnuclear spiral- and ring-like structures, inner kinematical twists,kinematical decoupling of a nuclear spiral, streaming motions alongspiral arms and misalignment between kinematical and photometricorientation axes. Using archival Chandra observations of 19 LINERs, we explore the X-rayproperties of their inner kiloparsec to determine the origin of theirnuclear X-ray emission, to investigate the presence of an AGN, and toidentify the power source of the optical emission lines. The relativenumbers of LINER types in our sample are similar to those in opticalspectroscopic surveys. We find that diffuse, thermal emission is verycommon and is concentrated within the central few hundred parsecs. Theaverage spectra of the hot gas in spiral and elliptical galaxies arevery similar to those of normal galaxies. They can be fitted with athermal plasma (kT~0.5 keV) plus a power-law (photon index of 1.3-1.5)model. There are on average three detected point sources in their innerkiloparsec with 1037 ergss-1<1040 ergss-1. The average cumulative luminosity functions for sourcesin spiral and elliptical galaxies are identical to those of normalgalaxies. In the innermost circle of 2.5" radius in each galaxy we findan AGN in 12 of the 19 galaxies. The AGNs contribute a median of 60% ofthe 0.5-10 keV luminosity of the central 2.5" region, and they haveluminosities of 1037-1039 ergs s-1(Eddington ratios of 10-8 to 10-5). The ionizingluminosity of the AGNs is not enough to power the observed opticalemission lines in this particular sample. Thus, we suggest that thelines are powered either by the mechanical interaction of an AGN jet (orwind) with the circumnuclear gas or by stellar processes, such asphotoionization by post-AGB stars from an old or intermediate-agepopulation (in most cases) or by young stars (in a few cases). We use HST ACS imaging of 100 early-type galaxies in the ACS VirgoCluster Survey to investigate the nature of diffuse star clusters(DSCs). Compared to globular clusters (GCs), these star clusters havelow luminosities (MV>-8) and a broad distribution of sizes(3<30 pc), but they are principally characterized bytheir low mean surface brightnesses, which can be more than 3 magfainter than a typical GC (μg>20 magarcsec-2). The median colors of diffuse star cluster systems(1.1<1.6) are redder than metal-rich GCs and often as red asthe galaxy itself. Most DSC systems thus have mean ages older than 5 Gyror else have supersolar metallicities, implying that diffuse starclusters are likely to be long-lived. Twelve galaxies in our samplecontain a significant excess of diffuse star cluster candidates; nineare morphologically classified as lenticulars (S0s), and five visiblycontain dust. We also find DSCs in the halo of the giant elliptical M49,near the companion galaxy VCC 1199. Most DSC systems appear spatiallyassociated with galactic disks, but substantial DSC populations are notpresent in all lenticular galaxies, and environment is not a goodpredictor of their existence. Diffuse star clusters are similar to andinclude the locus of ``faint fuzzies'' identified in other nearbygalaxies. Unlike luminous GCs, whose sizes are constant with luminosity,DSCs are bounded at the bright end by an envelope of nearly constantsurface brightness. We suggest that populations of diffuse star clusterspreferentially form, survive, and coevolve with galactic disks. Theirproperties are broadly consistent with those of merged star clustercomplexes, and we note that despite being 3-5 mag brighter than DSCs,ultracompact dwarfs have similar surface brightnesses. 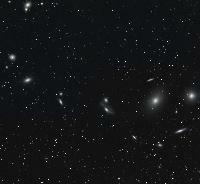 The closestGalactic analogs to the DSCs are the old open clusters, and if a diffusestar cluster population did exist in the disk of the Milky Way, it wouldbe very difficult to find.Based on observations with the NASA/ESA Hubble Space Telescope obtainedat the Space Telescope Science Institute, which is operated by theAssociation of Universities for Research in Astronomy, Inc., under NASAcontract NAS 5-26555. Context: .Observational follow-up programmes for the characterization ofultra-luminous X-ray sources (ULXs) require the construction of cleansamples of such sources in which the contamination byforeground/background sources is minimum. Aims: .We calculate thedegree of foreground/background contaminants among the ULX samplecandidates in a published catalogue and compare these computations withavailable spectroscopic identifications. Methods: .We usestatistics based on known densities of X-ray sources and AGN/QSOsselected in the optical. The analysis is done individually for eachparent galaxy. The existing identifications of the optical counterpartsare compiled from the literature. Results: .More than a half ofthe ULXs, within twice the distance of the major axis of the 25mag/arcsec2 isophote from RC3 nearby galaxies and with X-rayluminosities L_X[ 2-10 keV] ≥q; 1039 erg/s, are expected tobe high redshift background QSOs. A list of 25 objects (clean sample)confirmed to be real ULXs or to have a low probability of beingcontaminant foreground/background objects is provided. In a recently completed survey of the stellar population properties oflow-ionization nuclear emission-line regions (LINERs) and LINER/HIItransition objects (TOs), we have identified a numerous class ofgalactic nuclei which stand out because of their conspicuous108-9 yr populations, traced by high-order Balmer absorptionlines and other stellar indices. These objects are called `young-TOs',because they all have TO-like emission-line ratios. In this paper weextend this previous work, which concentrated on the nuclear properties,by investigating the radial variations of spectral properties inlow-luminosity active galactic nuclei (LLAGNs). Our analysis is based onhigh signal-to-noise ratio (S/N) long-slit spectra in the 3500-5500Å interval for a sample of 47 galaxies. The data probe distancesof typically up to 850 pc from the nucleus with a resolution of ~100 pc(~1 arcsec) and S/N ~ 30. Stellar population gradients are mapped by theradial profiles of absorption-line equivalent widths and continuumcolours along the slit. These variations are further analysed by meansof a decomposition of each spectrum in terms of template galaxiesrepresentative of very young (<=107 yr), intermediate age(108-9 yr) and old (1010 yr) stellar populations.This study reveals that young-TOs also differ from old-TOs andold-LINERs in terms of the spatial distributions of their stellarpopulations and dust. Specifically, our main findings are as follows. (i) Significant stellar population gradients are found almostexclusively in young-TOs. (ii) The intermediate age population ofyoung-TOs, although heavily concentrated in the nucleus, reachesdistances of up to a few hundred pc from the nucleus. Nevertheless, thehalf width at half-maximum of its brightness profile is more typically100 pc or less. (iii) Objects with predominantly old stellar populationspresent spatially homogeneous spectra, be they LINERs or TOs. (iv)Young-TOs have much more dust in their central regions than otherLLAGNs. (v) The B-band luminosities of the central <~1 Gyr populationin young-TOs are within an order of magnitude of MB=-15,implying masses of the order of ~107-108Msolar. This population was 10-100 times more luminous in itsformation epoch, at which time young massive stars would have completelyoutshone any active nucleus, unless the AGN too was brighter in thepast. Outflows from three active galaxies: NGC 1482, NGC 4438 and NGC 6764. X-ray observations have revealed in other galaxies a class ofextranuclear X-ray point sources with X-ray luminosities of1039-1041 ergs s-1, exceeding theEddington luminosity for stellar mass X-ray binaries. Theseultraluminous X-ray sources (ULXs) may be powered by intermediate-massblack holes of a few thousand Msolar or stellar mass blackholes with special radiation processes. In this paper, we present asurvey of ULXs in 313 nearby galaxies withD25>1' within 40 Mpc with 467 ROSAT HighResolution Imager (HRI) archival observations. The HRI observations arereduced with uniform procedures, refined by simulations that help definethe point source detection algorithm employed in this survey. A sampleof 562 extragalactic X-ray point sources withLX=1038-1043 ergs s-1 isextracted from 173 survey galaxies, including 106 ULX candidates withinthe D25 isophotes of 63 galaxies and 110 ULX candidatesbetween 1D25 and 2D25 of 64 galaxies, from which aclean sample of 109 ULXs is constructed to minimize the contaminationfrom foreground or background objects. The strong connection betweenULXs and star formation is confirmed based on the striking preference ofULXs to occur in late-type galaxies, especially in star-forming regionssuch as spiral arms. ULXs are variable on timescales over days to yearsand exhibit a variety of long term variability patterns. Theidentifications of ULXs in the clean sample show some ULXs identified assupernovae (remnants), H II regions/nebulae, or young massive stars instar-forming regions, and a few other ULXs identified as old globularclusters. In a subsequent paper, the statistic properties of the surveywill be studied to calculate the occurrence frequencies and luminosityfunctions for ULXs in different types of galaxies to shed light on thenature of these enigmatic sources. We present archival high-resolution X-ray imaging observations of 25nearby LINERs observed by ACIS on board Chandra. This sample builds onour previously published proprietary and archival X-ray observations andincludes the complete set of LINERs with published black hole masses andFIR luminosities that have been observed by Chandra. Of the 82 LINERsobserved by Chandra, 41 (50%) display hard nuclear cores consistent withan AGN. The nuclear 2-10 keV luminosities of these AGN-LINERs range from~2×1038 to ~1×1044 ergss-1. Reinforcing our previous work, we find a significantcorrelation between the Eddington ratio,Lbol/LEdd, and the FIR luminosity,LFIR, as well as the IR brightness ratio,LFIR/LB, in the host galaxy of AGN-LINERs thatextends over 7 orders of magnitude in Lbol/LEdd.Combining our AGN-LINER sample with galaxies from other AGN subclasses,we find that this correlation is reinforced in a sample of 129 AGNs,extending over almost 9 orders of magnitude inLbol/LEdd. Using archival and previously publishedobservations of the 6.2 μm PAH feature from ISO, we find that it isunlikely that dust heating by the AGN dominates the FIR luminosity inour sample of AGNs. Our results may therefore imply a fundamental linkbetween the mass accretion rate (M˙), as measured by the Eddingtonratio, and the star formation rate (SFR), as measured by the FIRluminosity. Apart from the overall correlation, we find that thedifferent AGN subclasses occupy distinct regions in the LFIRand Lbol/LEdd plane. Assuming a constant radiativeefficiency for accretion, our results may imply a variation in theSFR/M˙ ratio as a function of AGN activity level, a result that mayhave significant consequences for our understanding of galaxy formationand black hole growth. Two independent sets of Chandra and HST images of the nuclear region ofM31 allow registration of X-ray and optical images to ~0.1". Thisregistration shows that none of the bright (~1037 ergss-1) X-ray sources near the nucleus is coincident with thecentral supermassive black hole, M31*. A 50 ks Chandra HRC image shows2.5 σ evidence for a faint (~1036 ergs s-1)discrete source that is consistent with the position of M31*. The Bondiradius of M31* is 0.9", making it one of the few supermassive blackholes with a resolvable accretion flow. This large radius and theprevious detections of diffuse X-ray-emitting gas in the nuclear regionmake M31* one of the most secure cases for a radiatively inefficientaccretion flow and place some of the most severe constraints on theradiative processes in such a flow. We present deep optical imaging of the inner ~1.5d×1.5d of theVirgo Cluster to search for diffuse intracluster light (ICL). Our imagereaches a 1 σ depth of μV=28.5 magarcsec-2, which is 1.5 mag arcsec-2 deeper thanprevious surveys, and reveals an intricate web of diffuse ICL. We seeseveral long (>100 kpc) tidal streamers, as well as a myriad ofsmaller scale tidal tails and bridges between galaxies. The diffuse haloof M87 is traced out to nearly 200 kpc, appearing very irregular onthese scales, while significant diffuse light is also detected aroundthe M84/M86 pair. Several galaxies in the core are embedded in commonenvelopes, suggesting they are true physical subgroups. The complexsubstructure of Virgo's diffuse ICL reflects the hierarchical nature ofcluster assembly, rather than being the product of smooth accretionaround a central galaxy. A CCD Photometric and Morphological Study of the Extended Halo and Filaments of ESO 383-45: A Galaxy Undergoing Ram Pressure Stripping, or a Tidal Merger Remnant? We present BV CCD surface photometry, profiles, and images of the galaxyESO 383-45, together with other galaxies in the same CCD field. We alsopresent a B-V color map of the field and images of the galaxies enhancedby self-correlation of pixel values and by digital ``unsharp masking. ''The extended halo and system of filaments of ESO 383-45 are seenclearly. We suggest that the evidence (radio jets and their curvatureand areas of diffuse optical emission) of a dense intergalactic medium(IGM) in this field toward the center of the IC 4296 cluster mayindicate that the galaxy ESO 383-45 is still undergoing ram pressurestripping of its gas, forming stars in the filaments, while the centralgalaxy has evolved to have a lenticular morphology. On the other hand,there are ``knots'' in the filaments that look like tidal dwarf galaxiesin formation, and previous simulations of the tidal interaction of twodisk galaxies have produced galaxies that can resemble ESO 383-45 fromcertain viewing angles. Other galaxies in the field appear to lie beyondthe IC 4296 cluster and may be part of sheets of galaxies previouslyidentified as connecting the Abell clusters of the Shapley supercluster.We identify many uncataloged faint extended objects that may representbackground clusters of galaxies or knots (possibly of star formation)associated with the filaments and diffuse IGM of ESO 383-45. The presentwork represents the first multicolor surface photometric study for allof these galaxies, and only ESO 383-45 has previously been studiedmorphologically, using digitally co-added Schmidt plates obtained bysome of the authors. We present GALEX near-ultraviolet (2310 Å) and far-ultraviolet(1530 Å) images of the interacting galaxy NGC 4438 (Arp 120) inthe center of the Virgo Cluster. These images show an extended (20 kpc)tidal tail at the northwest edge of the galaxy that was previouslyundetected at other wavelengths; this tail is 15-25 kpc from NGC 4438'snucleus. Except for in the nucleus, the UV morphology of NGC 4438 istotally different from the Hα + [N II] morphology, which is moresimilar to the X-ray emission, confirming its gas cooling origin. Westudy the star formation history of NGC 4438 by combiningspectrophotometric data in the UV-visible-near-IR wavelength range withpopulation synthesis and galaxy evolution models. The data areconsistent with a recent (~10 Myr), instantaneous burst of starformation in the newly discovered UV northwestern tail that issignificantly younger than the age of the tidal interaction with NGC4435, dated by dynamical models at ~100 Myr ago. Recent star formationevents are also present at the edge of the northern arm and in thesouthern tail, while totally lacking in the other regions, which aredominated by the old stellar population that was perturbed during thedynamical interaction with NGC 4435. The contribution of this recentstarburst to the total galaxy stellar mass is lower than 0.1%, anextremely low value for such a violent interaction. High-velocity,off-center tidal encounters such as that observed in Arp 120 are thusnot sufficient to significantly increase the star formation activity ofcluster galaxies. Dust in the outer regions of interacting galaxies. NGC 4438 is a highly perturbed spiral with a stellar tidal tail andextraplanar molecular gas, now very HI deficient, crossing the center ofthe Virgo cluster at high speed. Various authors have attributed theperturbed appearance to the ram pressure of the intracluster medium, thetidal interaction with NGC 4435, and an ISM-ISM collision between theISM of NGC 4438 and NGC 4435. We present new CO observations coveringvirtually all of NGC 4438 and the center of NGC 4435 and detailedsimulations including all of the above effects. For the first time CO isdetected in NGC 4435. In NGC 4438 we find double line profiles atdistances up to 40'' to the west and south-west and redshifted lineswith respect to galactic rotation in the south of the center. The lackof gas to the North and East coupled with the large gaseous extent tothe West and the redshifted and double line profiles can only bereproduced with a ram pressure wind. NGC 4438 is most probably on itsfirst passage through the cluster center and has been stripped of its HIonly over the past 100 Myr. While an ISM-ISM collision between NGC 4435and NGC 4438 may occur, the effect is not significant compared to rampressure and tidal forces, not surprising for the passage of an S0galaxy 5-10 kpc from the center of NGC 4438. We also detect narrow COlines, in the absence of detected HI, in the northern tidal arm some 15kpc from the center of NGC 4438. This can be understood from thesimulations assuming a few percent of the gas is too dense to experiencethe ram pressure wind. 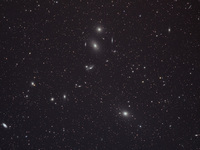 NGC 4438 has changed greatly over the past 100Myr due to its plunge through the center of the Virgo cluster and theinteraction with the S0 NGC 4435. The ram pressure wind has a strongeffect which is increased by the interaction with NGC 4435, bringing gasfurther from NGC 4438 where the ram pressure strips it away. Deep Effelsberg Hi spectra of the one-armed, bright Virgo cluster spiralgalaxy NGC 4254 are presented. Five different positions were observed inthe 21 cm Hi line with the Effelsberg 100-m telescope: one in the centerand 4 located one HPBW to the NE, NW, SW, and SE, respectively, from thegalaxy center. The spectra are compared to existing deep VLAobservations, and the single dish and interferometric Hi data are usedto constrain a dynamical model which includes the effects of rampressure. The peculiar, one-armed spiral pattern of NGC 4254 and itsdistorted and kinematically perturbed atomic gas distribution can beexplained by a close and rapid encounter ~280 Myr ago with anothermassive Virgo galaxy, followed by ram pressure stripping that isongoing. The stripping occurs almost face-on, since the angle betweenthe disk and the orbital plane is 70°. The galaxy with which NGC4254 had its encounter is tentatively identified as the lenticular NGC4262. 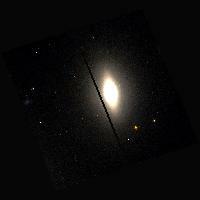 New Hα emission-line observations of the Virgo cluster galaxy NGC4438 are presented. Fabry-Perot interferometry data at an effectiveangular resolution of ~2 arcsec are used to map the kinematics of theionized gas in the galaxy. For the first time we obtain a velocity fieldcovering a large area in NGC 4438, much larger than that deduced fromprevious Hi and CO maps. The kinematics of the extended, low surfacebrightness Hα filaments to the West of the galactic disk isdiscussed. We report on the discovery of a northern Hα structurewhich is clumpier than the other filaments. Evidence for multiplespectral components through the data-cube are presented in a nuclearshell and in the approaching half of the disk. The role of VCC 1040, adwarf elliptical galaxy located to the South of NGC 4438, is presentedto investigate the origin of a small-scale stellar tail of NGC 4438. Itcould be due to a minor tidal interaction between the two galaxies. We present results from an ongoing survey of the ionized gas kinematicsin Virgo cluster spiral galaxies using Fabry-Perot (FP) interferometry.Our goal is to study the environmental effects on galaxy evolution inthe Virgo cluster. We report here on the Hα distribution map andvelocity field of NGC 4438, an interacting galaxy near the centre ofthe cluster. We describe the various Hα morphologies of Virgo Cluster andisolated spiral galaxies and associate the Hα morphologies withthe types of environmental interactions that have altered the clustergalaxies. The spatial distributions of Hα and R-band emission areused to divide the star formation morphologies of the 52 Virgo Clusterspiral galaxies into several categories: normal (37%), anemic (6%),enhanced (6%), and (spatially) truncated (52%). Truncated galaxies arefurther subdivided on the basis of their inner star formation rates intotruncated/normal (37%), truncated/compact (6%), truncated/anemic (8%),and truncated/enhanced (2%). The fraction of anemic galaxies isrelatively small (6%-13%) in both environments, suggesting thatstarvation is not a major factor in the reduced star formation rates ofVirgo spiral galaxies. The majority of Virgo spiral galaxies have theirHα disks truncated (52%), whereas truncated Hα disks arerarer in isolated galaxies (12%). Most of the Hα-truncatedgalaxies have relatively undisturbed stellar disks and normal toslightly enhanced inner disk star formation rates, suggesting thatintracluster medium-interstellar medium (ICM-ISM) stripping is the mainmechanism causing the reduced star formation rates of Virgo spiralgalaxies. Several of the truncated galaxies are peculiar, with enhancedcentral star formation rates, disturbed stellar disks, and barlikedistributions of luminous H II complexes inside the central 1 kpc but nostar formation beyond, suggesting that recent tidal interactions orminor mergers have also influenced their morphology. Two highly inclinedHα-truncated spiral galaxies have numerous extraplanar H IIregions and are likely in an active phase of ICM-ISM stripping. Severalspiral galaxies have one-sided Hα enhancements at the outer edgeof their truncated Hα disks, suggesting modest local enhancementsin their star formation rates due to ICM-ISM interactions. Low-velocitytidal interactions and perhaps outer cluster H I accretion seem to bethe triggers for enhanced global star formation in four Virgo galaxies.These results indicate that most Virgo spiral galaxies experienceICM-ISM stripping, many experience significant tidal effects, and manyexperience both. We present results from a 25 ks Chandra ACIS-S observation of galaxiesNGC 4438 and NGC 4435 in the Virgo Cluster. X-ray emission in NGC 4438is observed in a ~700 pc nuclear region, a ~2.3 kpc spherical bulge, anda network of filaments extending 4-10 kpc to the west and southwest ofthe galaxy. The X-ray emission in all three regions is highly correlatedto similar features observed in Hα. Spectra of the filaments andbulge are well represented by a 0.4 keV MEKAL model with combined 0.3-2keV intrinsic luminosity LX=1.24×1040 ergss-1, electron densities ~0.02-0.04 cm-3, coolingtimes of 400-700 Myr, and X-ray gas mass <~3.7×108Msolar. In the nuclear region of NGC 4438 X-ray emission isseen from the nucleus and from two outflow bubbles extending 360 pc (730pc) to the northwest (southeast) of the nucleus. The spectrum of thenorthwest outflow bubble plus nucleus is well fitted by an absorbed(nH=1.9+1.0-0.4×1021cm-2) 0.58+0.04-0.10 keV MEKAL plasmamodel plus a heavily absorbed(nH=2.9+3.1-2.0×1022cm-2) Γ=2, power-law component. The electron density,cooling time, and X-ray gas mass in the northwest outflow are ~0.5cm-3, 30 Myr, and 3.5×106 Msolar,respectively. Weak X-ray emission is observed in the central region ofNGC 4435 with the peak of the hard emission coincident with the galaxy'soptical center, while the peak of the soft X-ray emission is displaced316 pc to the northeast. The spectrum of NGC 4435 is well fitted by anonthermal power law plus a thermal component from 0.2-0.3 keV diffuseinterstellar medium gas. We argue that the X-ray properties of gasoutside the nuclear region in NGC 4438 and NGC 4435 favor ahigh-velocity, off-center collision between these galaxies ~100 Myr ago,while the nuclear X-ray-emitting outflow gas in NGC 4438 has been heatedonly recently (within ~1-2 Myr) by shocks (vs~600 kms-1) possibly powered by a central active galactic nucleus. We present a study of the stellar populations of low-luminosity activegalactic nuclei (LLAGNs). Our goal is to search for spectroscopicsignatures of young and intermediate-age stars and to investigate theirrelationship with the ionization mechanism in LLAGNs. The method used isbased on the stellar population synthesis of the optical continuum ofthe innermost (20-100 pc) regions in these galaxies. For this purpose,we have collected high spatial resolution optical (2900-5700 Å)STIS spectra of 28 nearby LLAGNs that are available in the Hubble SpaceTelescope archive. The analysis of these data is compared with a similaranalysis also presented here for 51 ground-based spectra of LLAGNs. Ourmain findings are as follows: (1) No features due to Wolf-Rayet starswere convincingly detected in the STIS spectra. (2) Young starscontribute very little to the optical continuum in the ground-basedaperture. However, the fraction of light provided by these stars ishigher than 10% in most of the weak-[O I] ([OI]/Hα<=0.25) LLAGNSTIS spectra. (3) Intermediate-age stars contribute significantly to theoptical continuum of these nuclei. This population is more frequent inobjects with weak than with strong [O I]. Weak-[O I] LLAGNs that haveyoung stars stand out for their intermediate-age population. (4) Most ofthe strong-[O I] LLAGNs have predominantly old stellar population. A fewof these objects also show a featureless continuum that contributessignificantly to the optical continuum. These results suggest that youngand intermediate-age stars do not play a significant role in theionization of LLAGNs with strong [O I]. However, the ionization inweak-[O I] LLAGNs with young and/or intermediate-age populations couldbe due to stellar processes. A comparison of the properties of theseobjects with Seyfert 2 galaxies that harbor a nuclear starburst suggeststhat weak-[O I] LLAGNs are the lower luminosity counterparts of theSeyfert 2 composite nuclei.Based on observations with the NASA/ESA Hubble Space Telescope, obtainedat the Space Telescope Science Institute, which is operated by theAssociation of Universities for Research in Astronomy, Inc., under NASAcontract NAS 5-26555. Based on observations made with the Nordic OpticalTelescope (NOT), operated on the island of La Palma jointly by Denmark,Finland, Iceland, Norway, and Sweden, in the Spanish Observatorio delRoque de los Muchachos of the Instituto de Astrofísica deCanarias. We present a spectroscopic study of the stellar populations oflow-luminosity active galactic nuclei (LLAGNs). Our main goal is todetermine whether the stars that live in the innermost (100 pc scale)regions of these galaxies are in some way related to the emission-lineproperties, which would imply a link between the stellar population andthe ionization mechanism. High signal-to-noise ratio, ground-basedlong-slit spectra in the 3500-5500 Å interval were collected for60 galaxies: 51 LINERs and LINER/H II transition objects, two starburstgalaxies, and seven nonactive galaxies. In this paper, the first of aseries, we (1) describe the sample; (2) present the nuclear spectra; (3)characterize the stellar populations of LLAGNs by means of an empiricalcomparison with normal galaxies; (4) measure a set of spectral indices,including several absorption-line equivalent widths and colorsindicative of stellar populations; and (5) correlate the stellar indiceswith emission-line ratios that may distinguish between possibleexcitation sources for the gas. Our main findings are as follows: (1)Few LLAGNs have a detectable young (<~107 yr) starburstcomponent, indicating that very massive stars do not contributesignificantly to the optical continuum. In particular, no features dueto Wolf-Rayet stars were convincingly detected. (2) High-order Balmerabsorption lines of H I (HOBLs), on the other hand, are detected in ~40%of LLAGNs. These features, which are strongest in108-109 yr intermediate-age stellar populations,are accompanied by diluted metal absorption lines and bluer colors thanother objects in the sample. (3) These intermediate-age populations arevery common (~50%) in LLAGNs with relatively weak [O I] emission([OI]/Hα<=0.25) but rare (~10%) in LLAGNs with stronger [O I].This is intriguing since LLAGNs with weak [O I] have been previouslyhypothesized to be ``transition objects'' in which both an AGN and youngstars contribute to the emission-line excitation. Massive stars, ifpresent, are completely outshone by intermediate-age and old stars inthe optical. This happens in at least a couple of objects whereindependent UV spectroscopy detects young starbursts not seen in theoptical. (4) Objects with predominantly old stars span the whole rangeof [O I]/Hα values, but (5) sources with significant young and/orintermediate-age populations are nearly all (~90%) weak-[O I] emitters.These new findings suggest a link between the stellar populations andthe gas ionization mechanism. The strong-[O I] objects are most likelytrue LLAGNs, with stellar processes being insignificant. However, theweak-[O I] objects may comprise two populations, one where theionization is dominated by stellar processes and another where it isgoverned by either an AGN or a more even mixture of stellar and AGNprocesses. Possible stellar sources for the ionization include weakstarbursts, supernova remnants, and evolved poststarburst populations.These scenarios are examined and constrained by means of complementaryobservations and detailed modeling of the stellar populations inforthcoming communications.Based on observations made with the Nordic Optical Telescope, operatedon the island of La Palma jointly by Denmark, Finland, Iceland, Norway,and Sweden, in the Spanish Observatorio del Roque de los Muchachos ofthe Instituto de Astrofísica de Canárias.